Integrated dust collection system power tool manufacturer iQ Power Tools recently introduced the IQ Power Tools Dry Cut Tile Saw, designed to cut ceramic, porcelain, marble, and stone – all without water. This unique 10-inch dry-cut tile saw, with a fully integrated dust control technology, allows for tile to be cut inside or outside with no water and no dust discharge. The IQ Power Tools Dry Cut Tile Saw, 100% compliant with the new OSHA standard for respirable silica dust, uses a three-stage filtration system which captures up to 99.5% of the dust. tray. A vacuum removes cutting debris and cools the specially-designed blades, reducing friction and heat. The saw is also built on wheels for transport around the jobsite. 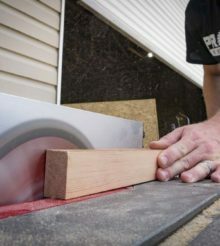 We targeted the IQ Power Tools Dry Cut Tile Saw before we headed out to Las Vegas for World of Concrete as one of the tools we absolutely had to see. An effective dry cut tile saw has the potential to absolutely change the game for professional users. Our preview of the saw didn’t disappoint us. Given the test cuts we saw, the design offers outstanding cutting performance and dust collection. One of the big questions we had going in was the build quality of the unit and it seems IQ did their homework in that regard as well. The $99 blade is proprietary and protects the saw against use of other blades with a Q-shaped arbor. While that may seem like a pain, no one else makes blades for this kind of saw since (as far as we know) it’s the only one in existence. You simply can’t use another blade on it without sacrificing performance, collection, or safety, so IQ made sure you can’t put another blade on it. There’s a bit of sticker shock with a $1740 price tag that includes the stand, but we think it will be well worth it. Once we get a unit in for more thorough testing, we’ll know for sure. Check out more from IQ Power Tools at Acme Tools!